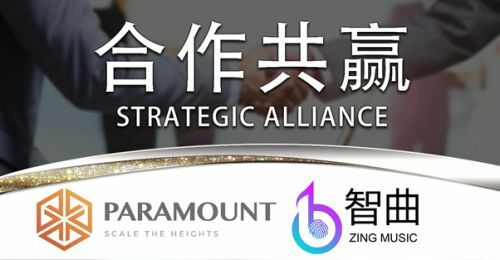 HONG KONG, Mar 20, 2019 - (ACN Newswire) - Zing Music Technologies Limited has entered into a strategic alliance with Paramount Elites Limited to develop big data marketing in the Asia Region. Paramount Elites Limited originates from the US, a new age alternative investment company with more than 20 years of marketing experience. Paramount's business spans the United States and Europe, the cooperation with Zing allows Paramount Elites to enter the Asian market for the first time. Popular entertainment app Zing was jointly created by Zing Music and Hong Kong Zing Music Technologies Ltd. Through integrating the killer function of music creation with the collaborative nature of the Internet community, and the indisputability of the copyright protection technology, the project aims to build an ecosystem comprising of collaborative music creators, clear intellectual property rights, and distinct interest systems. Then more good news emerges since the large-scale press conference held in Beijing on October 25, 2018: Zing has reached a strategic cooperation with multinational company Paramount Elites to develop big data marketing in the Asia Region. In order to penetrate the internet advertising market in China, Paramount Elites hired Mr. Shane Rice, former Executive Vice President of Omnicom Group as the CEO of Paramount Elites Asia. With his experience as the Executive Vice President of The United States top digital advertising agency, his main task is to drive innovation and connectivity solutions across Paramount Elites' customer portfolio and open new market in Asia. Mr. Rice commented that he was very honoured to be appointed CEO of the Asia Division and he is very optimistic about this project. He said, "China's internet industry is one of the largest and most exciting in the world. In fact, China has twice as many internet users as the total population of the United States! We believe this to be a highly lucrative market and with our advertising alliance program, we find the perfect strategy to penetrate a market once monopolized by the China Tech Trinity Baidu, Tencent and Alibaba." Paramount Elites is a multinational company with strong financial background while Zing is an up and coming popular entertainment app that encourage social interactions through the love of music. With advertising expert Mr. Shane Rice leading this strategic alliance, the Asia's Internet Advertising Market looks set for a facelift.